Collum I (originally Collum Hall), located on the Georgia Southwestern State University (GSWSU) campus in Americus, Georgia, recently received an award for Excellence in Rehabilitation from the Georgia Trust for Historic Preservation. The rehabilitation project was designed by McCall Architecture of Valdosta, Georgia, and constructed by Allstate Construction, Inc. of Tallahassee, Florida, and was completed in 2011. Located on the portion of the GSWSU campus known as the Third District A & M School/Georgia Southwestern College Historic District, Collum Hall (presently Collum I) was constructed between 1951 and 1952. With Governor Talmadge as the principal speaker, the building was dedicated on October 15, 1952. 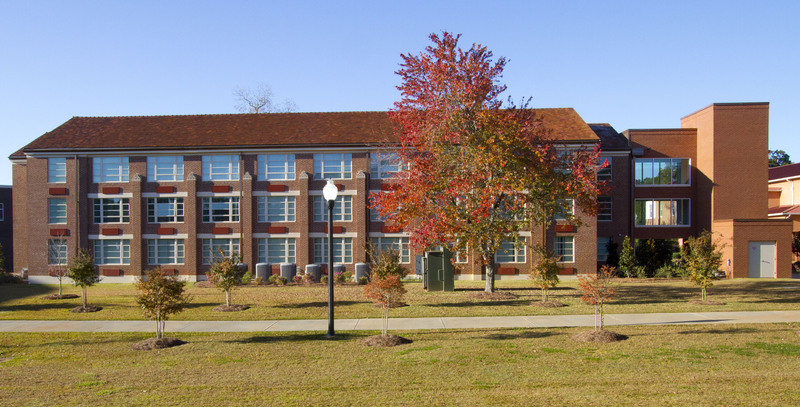 Designed by Logan and Williams as a men’s residence hall, Collum Hall was originally constructed at a cost of $166,800. It is one of eight contributing buildings which form the core of this historic campus. Most recently, when GSWSU needed more space for administrative offices and classrooms, they began to look at Collum I. The first floor of this building had previously been renovated for classroom use but the second and third floors had not been renovated and were not currently being used. Initially, GSWSU personnel considered demolishing Collum I and re-building, but after careful consideration, the decision was made to proceed with an adaptive re-use renovation of this historic structure, converting a 1950s era dormitory into a very functional and modern academic building, and ultimately saving money and keeping the core of this historic campus intact. This project included extensive abatement of hazardous materials on the second and third floors, while the first floor remained occupied and functional. Once the abatement was complete, all remaining finishes were removed, and existing wall partitions were removed to create larger classrooms, while leaving the original layout virtually unchanged, with a central hall flanked on both sides by rooms. Although the scope of the interior work of this project initially included only the second and third floors, the first floor (which had previously been renovated in an earlier project) required additional work in order to tie into existing systems and to remedy unforeseen conditions uncovered during demolition. In addition, the exterior of the three-story building was completely restored and an elevator/tower was sensitively placed at one end of the building. 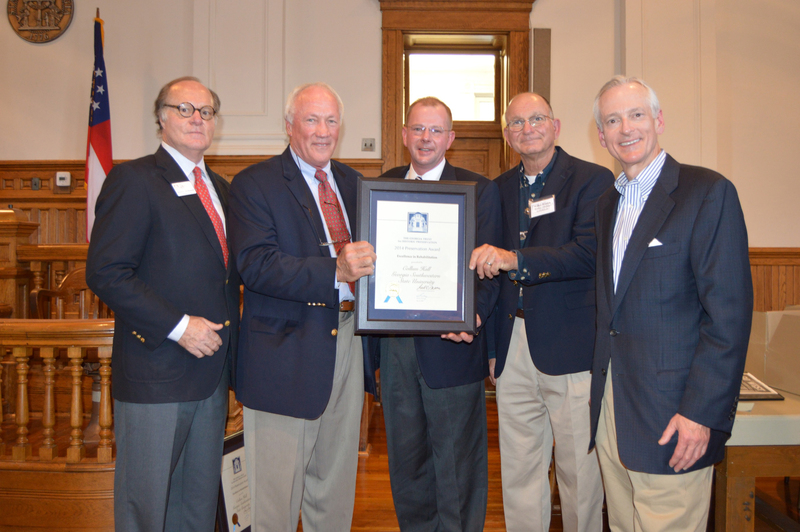 Annually, The Georgia Trust for Historic Preservation recognizes preservation projects and individuals in the State who have made significant contributions to the field of historic preservation, and awards are presented on the basis of the contributions of the project, or person, to the community and/or State and on compliance with the Secretary of the Interior’s Standards for the Treatment of Historic Properties. Excellence in Rehabilitation awards recognize projects that make compatible use of a building through repair, alterations or additions while preserving features of the property that convey its historic value. We are very pleased that this project was chosen as a recipient of this award in 2014. PHOTO ID (from l to r): Mark McDonald (Georgia Trust President and CEO), Bill Weldon (Allstate Construction, Inc.), Rusty McCall (McCall Architecture), Walter Vidak (Allstate Construction, Inc.), and Bill Peard (Georgia Trust Vice Chairman).